Today’s facial recognition systems are based on matching clean and well-lit photos taken in the broad light. This poses a problem for law enforcement and security services when their object is in the shade. However, a group of German scientists claim to have found a solution to this as they develop a new type of face-recognition system that analyzes a person’s thermal signature instead of relying on traditional methods. As a part of the new study, Saquib Sarfraz and Rainer Stiefelhagen, two computer scientists from the Karlsruhe Institute of Technology, Germany, created a system that analyzes mid- or far-infrared images and matches them with the ordinary photos thus allowing the people’s faces to be recognized. 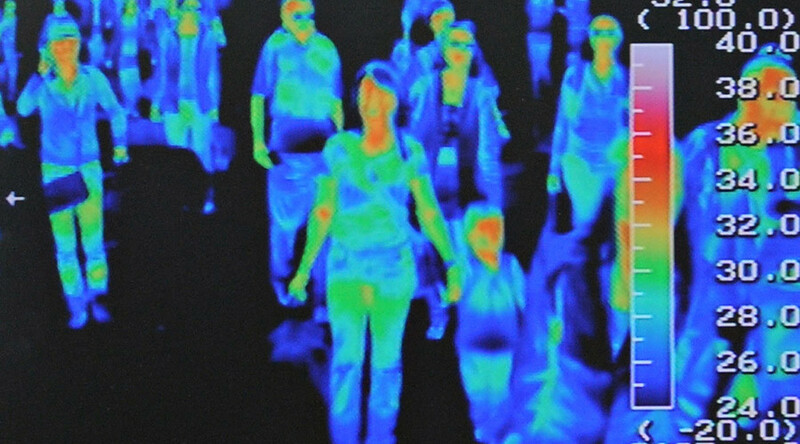 However, such matching also poses a challenge for computer systems as connection between human appearance in visible and infrared light is highly nonlinear. The way human face emits thermal signatures when infrared images are taken is absolutely different from the way the face reflects light during a regular photo session. Additionally, thermal emissions vary depending on the environment temperature, temperature of the skin, person’s activity level or even a change of expression. Besides, the images taken by infrared cameras usually have much lower resolution than normal photos. All these factors make the matching of two types of images a challenging task. The research team managed to overcome this difficulty by using the so-called deep neural network system. Deep neural network is a computer system designed to imitate the functioning of a human brain. It can make connections and draw conclusions based on complex sets of factors provided that a large enough dataset is available for the system. However, such smart system still needs a vast bank of both infrared and visible light images allowing it to make comparisons and “learn.” For their study, German researchers used the University of Notre Dame set that contains a significant number of both types of images, including people shot with different facial expressions, under different lightning conditions and multiple images of the same person over a certain time period. The data set used in the study consisted of 4.585 both infrared and visible light images of 82 people. For the research, the scientists divided the set into two parts and used the images of the first 41 people to “train” their system and the images of the rest 41 people to test it. The results of the experiment showed that the new system considerably surpasses its existing counterparts. “The presented approach improves the state-of-the-art by more than 10 percent,” Sarfraz and Stiefelhagen said as quoted by the MIT Technology Review. Additionally, the system is capable of matching the images and recognizing a face in just 35 milliseconds. “This is therefore, very fast and capable of running in real-time at about 28 fps,” the researchers say. However, the development of the technology is only at the initial stages so it is far from perfect as its accuracy reaches only about 80% in case when the system has many visible light images in its database to compare to the thermal image. With only one visible image available, the accuracy of the system falls to 55%.